This week, I placed an order at ASOS and it arrived the other day. I was heading out to meet my friends on the evening and this is the outfit that I wore with one difference… the added creases in the dress! Basically my parcel arrived, I had like 10 minutes to get ready, so I popped the dress on, got Mr WLL to take my photos and then whipped it off, he ironed it for me (he’s good like that, I can’t iron because of the damage left off an accident) while I wrapped our friends birthday gift and then I popped the dress back on and we sped off into the night! My new dress is the Alice & You Bandeau Crochet Trim Maxi Dress from ASOS and I have actually been lusting after this dress for about a month now. Ever since I first set eyes on this dress, I knew that I had to have it because I love the bodice layer with the contrast crochet trim. Its ultra flattering and so easy to wear during the summertime. This dress is made of a woven fabric that feels a bit like cheesecloth and unfortunately, it creases terribly. It arrived creased as you can see and even after ironing it, bearing in mind the fabric does have a texture to it, it becomes creased very quickly. When I sat down on the night, when I went to get up the dress was creased where I had been sitting which is a big pain. I’d bought it to wear on holiday next month as I’m going to a hot country and the lightweight fabric of this dress would be perfect but I just don’t think there’s any point in taking it with me as it will be creased to hell by the time I get there, argh! What do you all think? 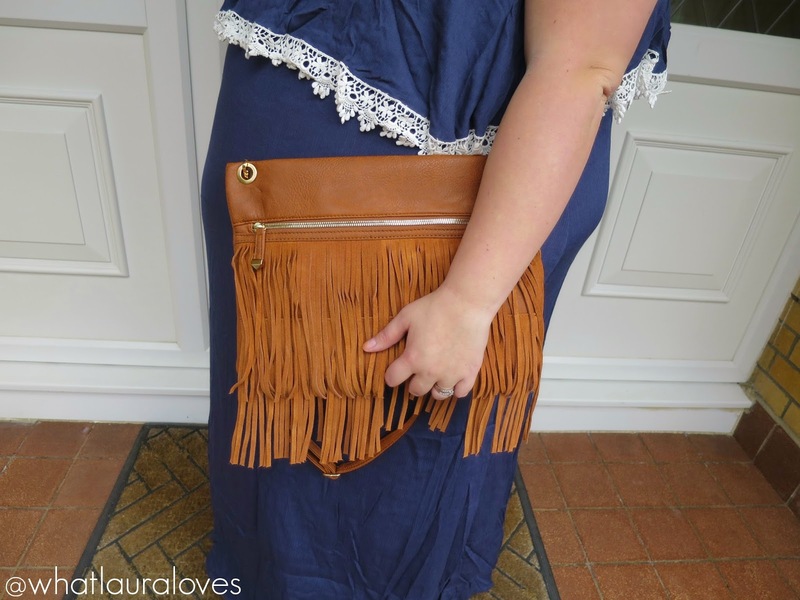 Another new item that I picked up from ASOS is this gorgeous fringe bag that I have been lusting after for the last few weeks too. I’m sure you’re all aware that I love my designer handbags but I really like to buy designer bags that I know I’m still going to love in ten years time. I have only just started to enjoy the fringe trend and didn’t want to invest in a very expensive bag that I might not enjoy next summer. When I came across the New Look Fringe Clutch Bag I made a mental note to come back to it in a few weeks time if I was still thinking about it. Well, that time came when I was at a gathering at my friends house last week and a lovely lady who was there had this bag and as soon as I saw it, I had to get it. It is quite a large bag with a detachable long adjustable strap so it can either be carried as a clutch, worn over the shoulder or across the body. It has one long zip across it that opens up into the inside compartment which also has a small zipped compartment inside. The front of the bag has the gorgeous fringing on it and it is in a leather look material that feels very soft. I’m so happy with this bag and I cannot wait to wear it this summer, starting with my glamping trip this weekend! I bought it in tan for a very affordable price (tip check this site for discounts before ordering!) and it is also available in black. My chunky bangle is from Next last summer and the sandals that I’m wearing are some oldies from Faith, I’ve been wearing these a lot recently but to be honest, they’re not that comfortable as the soles are very hard. I much prefer my Michael Kors ones which are SO flexible under foot. With all honesty I think this dress looks stunning on you and I love it so much I'm considering buying it. On the other hand if it creases that easily it's quite annoying, I have clothes that do the same and I tend to not wear them for that reason. They're also harder to iron.